Earlier this year, I introduced you to an awesome teaching couple from Texas: Linda and Eric Lopez. These two have some of really wonderful materials in Spanish that they've been putting together for the bilingual classroom. Linda and Eric have generously agreed to participate in this year's Back-to-School Fiesta with one of their Spanish science sets, Habitats: Biomas del Mundo. The pack comes with posters, writing sheets, picture cards, vocabulary cards, matching game, and graphic organizers - all in Spanish. You can download a preview of the file here. 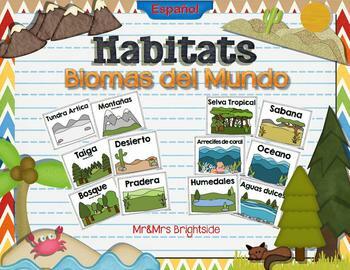 I'm so delighted that they've agreed to give a copy of one of their Spanish science sets, Habitats: Biomas del Mundo to two MommyMaestra readers.